How to Change Up Mac and Cheese - it's BABY time! Do you get easily tired of eating the same thing over and over again? We all do. Except for toddlers, that is! They can go through phases where they’ll eat one thing and one thing only for an entire week or longer. And you know what nearly every kid’s favorite is? Macaroni and cheese! It may seem like a boring dish after a while but there are healthy ways to change up mac and cheese so even you will want to eat it every night. 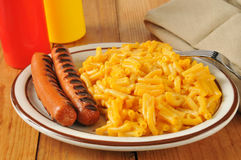 I’ve found some creative ways to make plain old mac and cheese a new hit plus some clever recipes to sneak in veggies! Preheat oven to 350°F. Cook macaroni according to the directions on package, drain. In a large bowl, mix mustard and celery seed together. Add macaroni to the bowl and stir well to combine. Add the franks, diced tomatoes, onion and celery and combine lightly. Pour mixture into a 1- 1/2 quart casserole dish. Cover and bake for 30 minutes or until cooked thoroughly. Makes 6 servings. Have a picky eater that turns their nose up at the mere sight of squash? No worries! With this tasty recipe you can cleverly get in this vegetable rich in Vitamin A and they’ll be none the wiser. Preheat your oven to 350° F. You will need a 2-quart square baking dish, coated with non-stick cooking spray. Cook the fusilli accordingly per the directions on the package, drain, and return to pot to keep warm. Boil the squash in a pot of water until soft enough to mash with a fork. Meanwhile, make cheese sauce by melting butter in a sauce pan, add the flour and salt and stir for one minute over medium heat. Stir in milk until it begins to bubble and thicken. Remove pot from heat and stir in cheese until melted. Drain the squash and mash well. Stir into the macaroni and cheese sauce. Combine all ingredients then transfer to baking dish. Sprinkle breadcrumbs over the dish evenly and bake for 20 minutes or until fully cooked. Here’s a crowd pleaser for parents and kids alike with chicken added into it. Even better, it only takes 30 minutes to prepare from start to finish! Cook the macaroni accordingly per the directions on the package. Drain and return to pot to keep warm. Meanwhile, melt butter in a medium sized saucepan over medium heat. Stir the flour into the butter then whisk in the milk. Continue to stir together until thickened and it starts to bubble. Cook for an additional minute together before removing the pan from heat. Add in cheese and stir until cheese is completely melted. Stir in the yogurt and mix well. Add to macaroni and mix thoroughly. Brown the ground chicken with cumin over medium heat in a skillet until it is fully cooked or no longer pink. Stir the meat as you cook to break it up. Stir in seasoned chicken with macaroni and enjoy! You may also top it with salsa for each serving if you’d like. Another popular kids favorite, pizza is incorporated into this delicious recipe for an easy crowd pleaser. Prepare macaroni as per the directions on package. Drain and return to pot to keep warm. Brown ground beef in a skillet over medium heat until cooked thoroughly and crumbly. Drain excess grease. Combine the ground beef, macaroni, pizza sauce, and tomato sauce in a bowl. 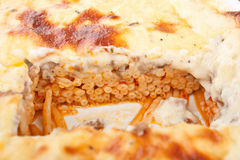 Layer half the mixture into a 9×12-inch baking dish and top with half of the shredded mozzarella. Layer the remaining macaroni mixture on top then top with the rest of the shredded cheese. Cover dish with aluminum foil and bake for approximately 35 minutes or until it is bubbling and cheese has melted. This is one of my favorites because my kids love peas! It’s an easy way to get them to eat some green without having to try to hide it. This recipe is very delicious for a lighter, creamy mac and cheese with a boost of protein from the Greek yogurt! Prepare your macaroni as directed according to package instructions. In a medium saucepan melt butter over medium heat. Stir in flour then whisk in the milk. Continue cooking while stirring until it begins to bubble and milk is thickened then cook for one minute longer. 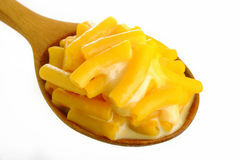 Remove from heat and stir in cheese until smooth. 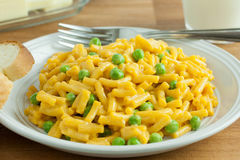 Once your macaroni has been drained and returned to pot, add in the sauce mixture and peas then combine. And you have a tasty dish. If you’re in a pinch and don’t have time to start preparing a baked macaroni and cheese dish, these are some ideas that you can easily prepare by simply adding different things to your classic stove-top mac and cheese. Mix it up using different types of pastas from elbow macaroni to shells, bow-tie, or penne. Some of these recipes were inspired from the boxed dinner varieties like Hamburger and Tuna Helper, but without the additives and preservatives! 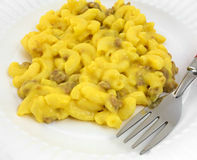 Cheeseburger Macaroni – prepare macaroni and cheese accordingly. Brown ground beef, drain and stir in with the mac and cheese. 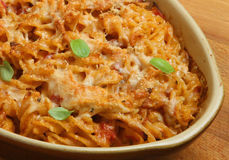 Tuna Mac and Cheese – drain a can of chunk light tuna and mix in with cooked fusilli and cheese. Add in some frozen peas to make it a meal! 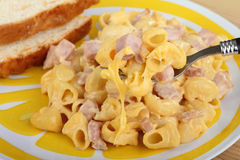 Ham and Cheese Mac – Add in cubes of cooked ham to your desired mac and cheese. For an even healthier version of these recipes, switch it up using whole grain pasta instead. If you have your own favorite ideas to change up mac and cheese share them in the comments below.